It's 1990 and the Bronx has officially been declared a "No Man's Land." The authorities have given up all attempts to restore law and order. 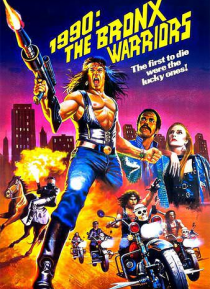 When a beautiful young woman runs away from Manhattan into this wasteland of motorcycle gangs and marauding warriors, her corrupt father sends a ruthless mercenary to bring her back at all costs. But gang leader Trash has other plans, uniting the rival outlaw… s to wage an all-out guerrilla war against their corporate oppressors.